Useful information for investors is paramount. Environmental, social and governance, commonly known as ESG, is a hot topic today in the boardroom, but what should companies be disclosing as far as these efforts? Directors got a bit of direction from the nation’s top securities regulator recently. 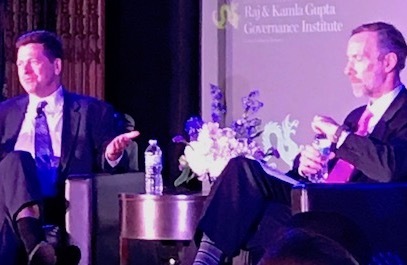 It all comes down to “what helps the investor make an informed investment decision,” stressed U.S. Securities and Exchange Commission Chairman Jay Clayton who spoke at Drexel University’s Directors Dialogue Dinner where the establishment of the Raj & Kamla Gupta Governance Institute was announced. The question about ESG disclosure came from F. William McNabb, the Institute’s first executive in residence and chairman Vanguard Group Inc., during a conversation the two men had before the Drexel audience earlier this month. But “S is difficult,” he maintained. “What are the metrics behind the S? It has to fit into what’s material before it becomes a requirement. What do people understand and what can be prepared efficiently? McNabb asked if there were specific things boards should be thinking about as the economy moves from industrial to services. McNabb asked whether Clayton could share best practices for boards? To that McNabb asked how boards should balance stakeholder-versus-shareholder need? “It’s a very hard question,” he replied. “Having a focal point for decision-making be what’s in the best interest of shareholders leads to much more efficient decision-making. McNabb countered that people trust their money with Vanguard and they expect a return. To that, Clayton said watching out for stakeholders could ultimately pay off for shareholders.